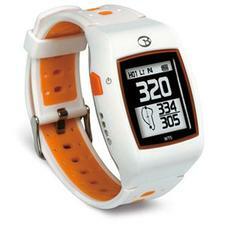 Golf Buddy WT5 GPS Watch White/ Orange ( No Annual Fee ) - See Price in Checkout! - GolfersEdgeOnline.com - Best Golf Equipment On The Web! The Feature Rich Golf GPS Watch The newest golf GPS watch from Golf Buddy is the WT5. When it's in golf mode, it has all the information you need to play your best: distances to the front, center and back of the greens, distances to targets and hazards and the placement of the pin. Dynamic Green View gives you a better read on those putts to lower your score and a digital scorecard lets you keep track of your game right on your wrist so you don't have to worry about forgetting a pencil for you scorecard. If you have any more questions about the Golf Buddy WT5 GPS Watch White/ Orange ( No Annual Fee ); do not see the model you are looking for; need custom options; or prefer to not purchase online, then please call us at (630) 656-1291.